Red light cameras have been deployed around the country to great effect, reducing crashes dramatically in New York City and Washington, DC. Given these successes in the East, it was natural for San Rafael to give them a try. But police said they were ineffective at reducing crashes, and that they cost more than they took in, so the city recently ditched them. Given state law in California, the results in San Rafael start to make some sense. Traditional traffic enforcement is meant to be punitive. Police can’t be everywhere, so, to change behavior, any violation caught needs to be punishing and painful. As a result, California has extremely high fines for red light violations: a minimum of $489. When a city switches on red light cameras, they generally try to limit them to key intersections. This ensures that most dangerous violations are caught, even if other violations at less important or less dangerous intersections are missed. Psychologically, this is not effective, as it does not create a culture where traffic violations are simply not done. Serial red light runners will continue to do so wherever they like, just avoiding the two or three intersections where they know they’ll get caught. Research finds dummy cameras, which flash a light but take no picture, are effective at stopping red light running, a strong indicator that running lights is often a conscious decision. To change behavior, one must apply a little force consistently, not a lot of force inconsistently. Red light cameras, when seen in this light, don’t do a very good job. They should be ubiquitous and cheap, with a relatively low-dollar ticket – maybe just $150 – that hits a driver for every red light run. California’s red light ticket minimum means ubiquitous tickets would add up rapidly. As it is, just one $489 ticket can be half of someone’s take-home pay for the month, or worse. It’s unjust to use such a painful instrument to change behavior city-wide, even if the end of crashes prevented is noble. As well, the high ticket fine opens cities up to criticism that traffic enforcement is simply a money grab, a politically toxic accusation that could kill any such comprehensive enforcement. Without the flexibility to catch red light runners every time, San Rafael’s experience with cameras was a poor one. Though a 2012 grand jury report found crashes declined by 12 percent up to that point, a police spokeswoman told me crashes increased by 1 fatality. The managing company, Redflex, was also a political headache. The IJ’s Megan Hansen reported, “Redflex has been losing contracts ever since it came under fire early last year when news broke the company was being investigated for corrupt business practices, including bribery and secret meetings.” Red light cameras are never politically easy, and paying a potentially corrupt company hundreds of thousands in taxpayer funds and ticket fines just makes things worse. Though traffic enforcement is vital to creating a safe environment for all road users, San Rafael should focus its efforts on street design rather than automated enforcement. Though the impulse among some may be to keep fines high, road safety advocates should advocate for laws that do the most good, not just the ones that feel right. To that end, California should create a two-tier system of ticket enforcement: one with dramatically lower fines for comprehensive automated enforcement schemes, and one with the existing fines for the spot-checking enforcement schemes cities rely on today. Though it’s unfortunate San Rafael did not get a good deal for its cameras, removing them was ultimately a response to bad state law. Perhaps one day the city will be able to install a system that changes how we think about traffic laws, but until then it’s probably best to just go without cameras altogether. Public transit ridership in the United States is higher than it’s been since 1956: 10.7 billion trips, up 1 percent from last year. While this indicates an overall trend toward transit, it’s been driven largely by high-quality transit: heavy rail like BART, commuter rail like Caltrain, and light rail like Muni Metro. Marin County’s transit picture largely echoes the national trend, though this is not a new story for our county. High-quality transit, namely trains elsewhere but ferries here, continues a ridership boom, as has commuter bus service, but local bus ridership continues to slowly slide. Overall, Marinites are taking more transit. Golden Gate Transit’s Marin-only service has been bleeding passengers for the past five years, from about 4.1 million to roughly 3.3 million today. Including Marin Transit’s independent operations, such as West Marin Stagecoach and school service, local ridership ticked down by 0.7 percent over last year, to 3.4 million trips. Golden Gate Transit’s commuter and basic routes to San Francisco, however, are doing quite well. For the past 32 months ridership has grown and, year on year, grew by 1.3 percent over January, 2013, to about 2.5 million trips. This, however, is still down from 2004’s 3 million trips. All that changes when you include the ferries. Despite a steep price hike in 2003, ferry ridership has been growing like gangbusters. Even excluding Sausalito, whose figures are skewed by tourists, Larkspur’s ridership growth has been more than enough to offset the long-term decline in regional bus ridership. Larkspur ridership grew by 7.3 percent in the past year, from approximately 1.5 million trips last year to about 1.6 million this year. Sausalito ridership grew twice as fast, 14.9 percent, though at around 750,000 annual trips it’s still a small share of total ridership. The rapid growth in the ferry system continues a now-32 month growth streak begun in 2011. It shot through its all-time record, set in 1978, in 2012, and shows no sign of slowing down. The national trend toward transit is really a national trend toward quality transit. Buses that come every hour and take 4 times as long to get around as a car just don’t cut it. Indeed, even as MTC has focused a huge amount of attention and money on moving people faster in cars, it has spent almost no time focused on moving people faster on transit. BART is the only major investment in the past half-century that has dramatically improved mobility through the Bay Area, but has now been expanded to areas that do little to boost ridership. Other booming systems are those that feel higher-class or that run as fast or faster than driving, such as Caltrain. In that light, it’s no surprise Marin’s high-class transit service, the ferry, is doing so well. So too is it no surprise that commuter buses, which generally offer a nicer ride than local buses, are steadily growing as well. Combined, the two systems grew by 3.5 percent this past year, quite a bit faster than Golden Gate Bridge traffic, which is up 2.4 percent. These and national trends should guide GGBHTD and Marin Transit as they choose their capital investments. Big investments in the bus system should focus on speed, for both the locals and commuters, and comfort, for the commuters. Signal priority, for example, which allows approaching buses to turn red lights green, would help make schedules more reliable and make the bus more competitive against the car. Small investments should focus on usability and connectivity. Open-source real-time arrival data for all buses, for example, would be a huge boon for riders, dispelling the anxiety one gets waiting for an infrequent bus to come. For ferries, their extremely fast growth rate means capacity problems are on the horizon. GGT needs to start laying the groundwork for more crossings from Larkspur. Ongoing problems with midday ridership will continue to be a roadblock to better service as well. Even faster-growing ridership at Sausalito may require more ferries to meet the demand. Marin’s experience shows national trends are indeed applicable to our county. Investments in usability, in connectivity, and in higher-quality trips would capitalize on overall demand for transbay travel, while investments in frequency and speed could stop the slide of local service. Transit planners here would do well to learn from the successes of others. A soaked bench at the Depot. Image by the author. During Marin’s big Pineapple Express a few of weeks ago, I had the pleasure of taking the bus all over Marin. Stepping off a bus without worrying about parking or gas or finding the car always feels liberating to me, so I thoroughly enjoyed that aspect. But thanks to bad stop design, I and my fellow riders got soaked. After chatting up some of protestors of WinCup, I walked along the narrow sidewalk to the closest southbound bus pad, not just to see what the walk was like but also because I had to get to Mill Valley. Aside from protestors using up the entire sidewalk width, forcing me to walk in the street, it wasn’t so bad. The bus pad, though, was another story. The bus pad shelter allowed the wind to whip rain right in the face of me and my fellow travelers. 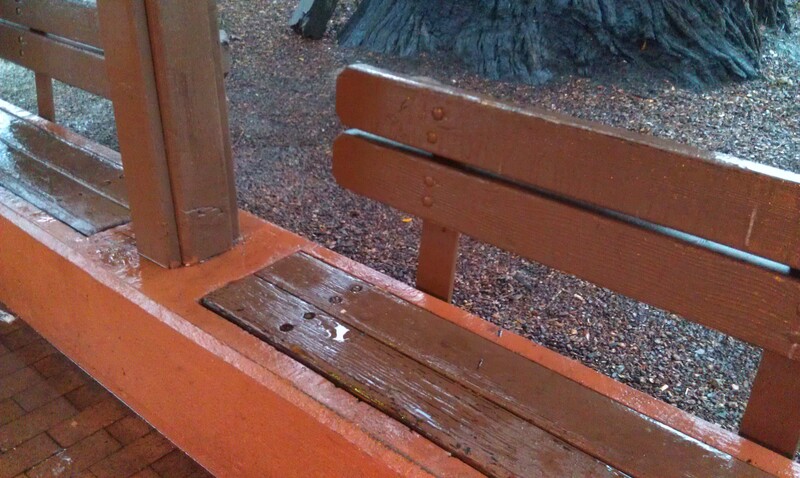 The bench was so soaked that sitting would have made for a cold and soggy experience. Someone else waiting spoke very little English but pointed at the rain and the bench and laughed. “Very wet,” she said, and it was quite clear she thought the situation was ridiculous. Though she was heading to Mill Valley, too, she hopped on the next bus that came (Route 36) just to get out of the wet. I decided to stick it out, though, and my Route 17 bus arrived soon enough. Alas, the Mill Valley Depot, central bus station of this most wealthy of towns, was in even worse shape. The roof dripped everywhere, soaking not just the benches but anyone who risked standing under it without an umbrella. Water trickled in from every slat in the roof and positively poured in through the light fixture. The state of repair on the Depot and the quality of the bus pad stops tells riders, You don’t really matter. For one of the wealthiest counties in the country and one that prides itself on being green and supporting the less fortunate, that’s unacceptable. If buses are a travel mode of equal stature to the car or ferry, bus stops – especially signature stops like the Depot – need to be treated like it. They should be comfortable, or at least bearable. The people who ride the bus for work or out of necessity do matter.